Greg Casey graduated from D aoist Traditions in 2014, he also holds an Associate Degree in Mathematics and Sciences from SUNY: Adirondack. He is certified by NCCAOM and is licensed to practice Chinese medicine in NC. He has also practiced in the state of RI as a licensed Doctor of Acupuncture. He recently returned to DTC as an instructor in the Fall of 2016. He plans to open a full service Chinese Medicine clinic in Weaverville, NC in 2017. In teaching qigong and martial arts, I most enjoy serving my students in developing deeper relationships with themselves. In teaching qigong and meditation specifically, I greatly enjoy seeing the sense of wonder and excitement that many people experience at the effects of learning and practicing these arts. In teaching Chinese medicine theory, I most enjoy serving students by helping them to connect the dots in their understanding of the depth and richness that underpins and infuses the practice of Chinese medicine. For me, self-cultivation is the most important aspect of Chinese medicine. I have always believed that as practitioners we can only go “as deep” with our patients as we have gone, or are willing to go with ourselves. 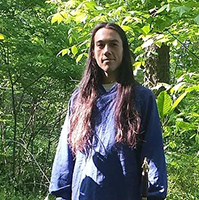 I have a lot of formalized practices such as meditation, qigong, Taijiquan and other martial arts that I practice every day to help keep me centered while simultaneously pushing the limits of my growth as a human being, both internally and externally. A good, regular practice in these arts can greatly help in navigating potentially stressful situations that may arise in clinic. What made you decide to study CM? My interest to study Chinese medicine grew out of my lifelong passion for martial arts. I was 4 years old when Power Rangers came out, and the idea of cultivating the abilities to improve oneself and protect others has been seeded in me for as long as I can remember. When I was 17 I began researching and practicing qigong and Taijiquan (Tai Chi) which led me to the study of Daoism and the awareness of the internal energy matrices of the human channel system which acupuncture utilizes to achieve its therapeutic effects. Tell us one thing about you that no one at DTC knows. Most don’t know that my first “patient” was a baby squirrel. A few days before my senior year of high school a friend called and told me he found a baby squirrel in a parking lot. It was tiny and flea ridden. I spent the night pulling fleas off it and researching appropriate forms of nutrition. Its eyes were barely open, it was dehydrated, could barely stand and it could fit in the palm of my hand. By the morning, he was up and crawling around. I got involved with a local wildlife rescue and rehabilitation clinic that semester, became a certified wildlife rehabilitator in the state of Rhode Island, and did my senior project on the whole experience. I am happy to say I fully rehabilitated and release the squirrel “little wu” that following spring in my neighborhood. I initially was going to go to college to study wildlife conservation biology. This was the same time I began studying qigong, Tai Chi and Daoist philosophy. After a year of that, I realized the animals had their way, and it was us humans who needed to be reminded to go to work on ourselves, realize we are a part of nature, and let the animals be to do what they will. This was also when I became vegetarian, and I have never looked back!